Home » Law Life » Off to the State Fair! Today I am going to my first ever STATE FAIR!!!!! Haha, okay, okay. I know this is completely ridiculous, but I’ve always wanted to go to a state fair and I’ve never been! I’ve been to a few county fairs and rodeos, but not a state fair! 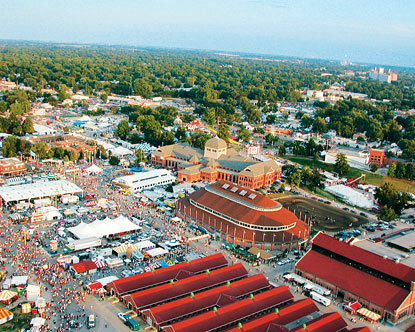 So this morning my brother and I are headed down to Springfield, IL for the Illinois State Fair. My sister-in-law, Lauren, was supposed to come but she’s not feeling so good. 🙁 So she’ll be home hanging with Molly (their new puppy) who I haven’t seen in a week! I hope she’s not too big! My brother and I have a goal of finding the most interesting thing we can that’s been fried…. This could get scary! One thing I’ve realized about blogger is that I can’t comment back on your comments! It drives me absolutely crazy! So here are my shout-outs to a few readers that I’ve been wanting to respond to! Aria: if you want to start a blog, then go for it! Just be committed! You have to do it for yourself and because you think it’s fun, that way if it is a flop, then oh well! You enjoyed it! Kelsey: I love being a nerd! I am obsessed with reading and constantly looking things up online that interest me! Wanting more knowledge is a great attribute! And that’s great that you have such a good best friend, my friends inspire me all the time! I’m lucky to have such interesting and brave women in my life! Lexi: The snoopy cup was from Target dollar spot a few years ago! I snagged one for my mom and one for myself because she LOVES snoopy! Whatilikeaboutfood: maybe try adding some sweetener to your smoothie? I add Truvia which is a brand of stevia all natural sweetener. You can also use any other sweetener or honey or agave. Or maybe start out with less spniach and see how that tastes? Also, my friend was at Chez Elle the day you recommended it! I’ve never been but now it’s on my KC list! Kiah: I’m glad you enjoy it! Be sure to send me an e-mail at peaceloveandoats@gmail.com if there are any topics you’d like to read about! That’s all I have time for now, gotta go get ready for the fair! What is the weirdest thing you’ve ever heard of deep fried and what’s the weirdest thing you’ve ever tried deep fried?